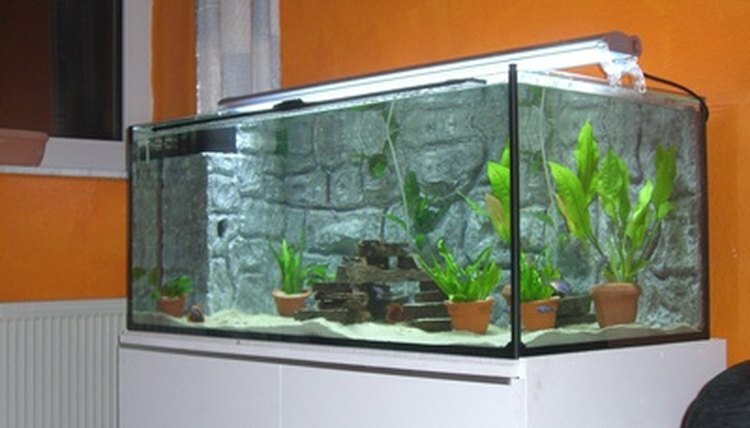 The AquaClear 70 Power Filter is designed to work in a 30 to 70 gallon fish tank. Utilizing a three-cartridge filtration system, the AquaClear 70 keeps aquarium water clear without removing beneficial bacteria. The filter also allows you to control the water flow rate and can be adjusted to filter from 100 to 300 gallons per hour. The AquaClear Power Filter comes with one of each of the three filter inserts as well as several other components. Assembly and set up takes approximately 15 to 20 minutes. Prepare the foam filter insert by rinsing it under a running tap for a few seconds. Insert it into the filter basket, pushing it all the way to the bottom so it completely fills it and there is no space between the basket base and sides. Take the carbon filter insert out of the plastic bag and rinse under running tap water to remove any excess carbon dust. Use your hands to flatten the insert, then place it horizontally in the filter basket. The carbon filter is stacked directly on top of the foam filter insert. Prepare the BioMax filter insert by cutting open the poly bag containing the filter contents. Hold open the mesh bag and pour the filter contents from the poly bag into the mesh bag. Slide the looped part of the locking clip over the open end of the mesh bag and pull the excess mesh through to form a small pouch. Slide the square locking mechanism over the loop of the locking clip until it clicks into place. Cut off the excess mesh. Rinse thoroughly under running tap water. Stack the assembled BioMax filter insert in the filter basket on top of the carbon insert. Place the filter basket into the square section of the filter case, keeping the foam filter insert on the bottom. Press gently until it moves into position, the bottom of the filter basket should be flush with the bottom of the filter case. Attach the intake "U" tube to the filter case, inserting the tube with the protruding tab above it into the section designed for it, located just in front of the motor. The other intake tube will hang over the front of the filter case. Press down gently on the tube until it clicks into place. The top of the "U" tube should be level with the top of the filter case. Slide the extension tube into the bottom of the overhanging intake tube of the "U" tube to connect them. Attach the leveling device to the filter case by inserting the peg into the tabbed section, located on the bottom of the filter case. Mount the Power Filter onto the back of your aquarium, motor side out. The overhanging intake tube should reach below the surface of the water. Turn the leveling device to adjust if necessary. Fill the filter case completely with water. Attach the filter case cover by snapping it in place. Move the water flow control level on the intake "U" tube to the maximum position. Plug in the filter's power cord and allow it to run on maximum power for approximately 45 seconds. Adjust the control level to desired water flow rate to begin using. Aquarium water may appear cloudy for the first few weeks after initial setup. This is normal. Use the filter at a reduced flow rate during feeding times or if you have very small or delicate fish. Do not operate the filter without water. Replace filters regularly. Carbon filter inserts should be replaced each month, foam filter insert should be replaced every two months and the BioMax filter should be replaced every three months. Never replace all the filter inserts at the same time.